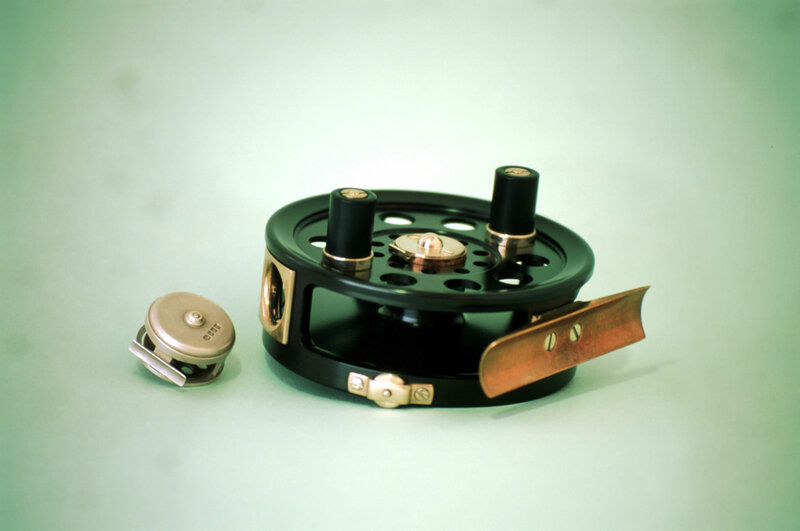 I designed and developed my own range of five sizes of handmade fly-fishing reels during the mid 1990's. I didn't realise at the time that its so obvious I'm Hardy trained! All are specified as size of drum back flange diameter. The little silver novelty I'll describe later. This project consumed two thousand hours spread over three years. A lot of the manhours went into â€™tooling upâ€™ so as to achieve interchangeable manufacture and the quality I demand, yet they still incorporate a high degree of 'craft' manufacture. The reel illustrated is my 2-3/4 inch (rear flange) fly reel, serial number 98/13, the thirteenth reel of 1998, gross weight 200 grams. My old boss at Hardys would have severely reprimanded me for producing such a heavy reel , yet it balances fine with a cane rod in my opinion. There are so many unique points of workmanship and design to these reels that they have to be seen to be appreciated. Jim Williams of 'Just Reels' [Wisconsin] when he offered his 'Richard Kell 4-1/2 inch Spey Reel' for sale recently, described my reel as probably the best to ever come out of the UK; I'm not sure I'd go that far, yet its one heck of a compliment. The stainless steel spindle is diamond lapped to within a two tenths of a thou inch total tolerance, the up tolerance spindles going into the larger diameter reels. I use engineers slip gauges to verify all dimensions such as this. Handles are of graphite impregnated ptfe at £80 a metre. 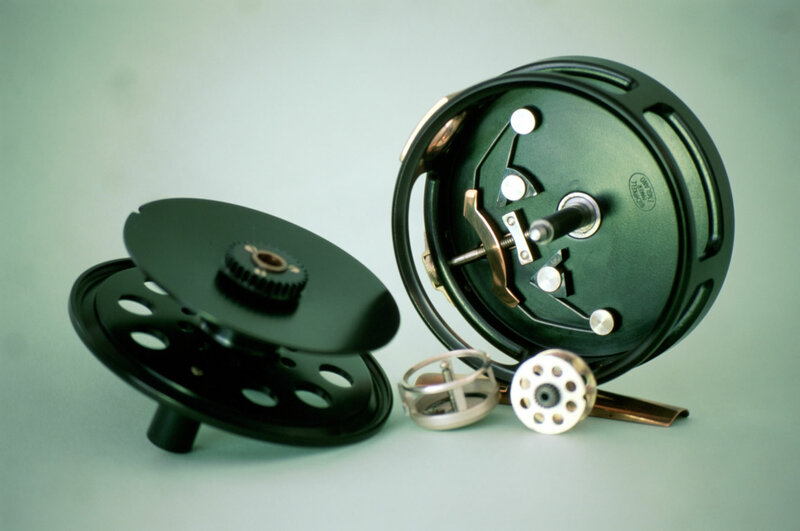 The reel drum incorporates a custom shouldered bronze bush which locates the nickel silver latch cover in its own recess and provides an excellent bearing combination with the diamond lapped spindle. The reels were unique at the time for their special surface treatment which is an advanced process beyond straightforward anodising, resistant to a Stanley knife and incredibly corrosion resistant. There are only one or two specialists in the world that can perform such work. I've a unique regulation indicating feature incorporated into all my fly reels, I call it the' blindmans indicator' as it does just that. Again uniquely, my reels are probably the only reels in the world that are designed to accept an enclosed rim or exposed rim drum on the same frame. The reel foot or back is cast gunmetal, as is the spring keeper, I make all my own brass patterns to send to the foundry. All my nickel silver countersunk screws are made to the old Hardy pre-war standard of increasing the angle to 60 degrees from the universal 90 degrees; this increases their strength as well as providing better locking. As with all my work the real quality is hidden, such as the attention to geometrical tolerances, something the layman wouldnâ€™t instantly perceive. The big 4-1/2 inch Spey (back /inner flange diameter) is a real beauty, very difficult to put down once you get to play around with it. I even experimented how to produce thick section agate jasper lineguards. Finally the little solid silver reel, which is fully working, has a Â¾ inch drum, hallmarked for Edinburgh, where I registered my mark. 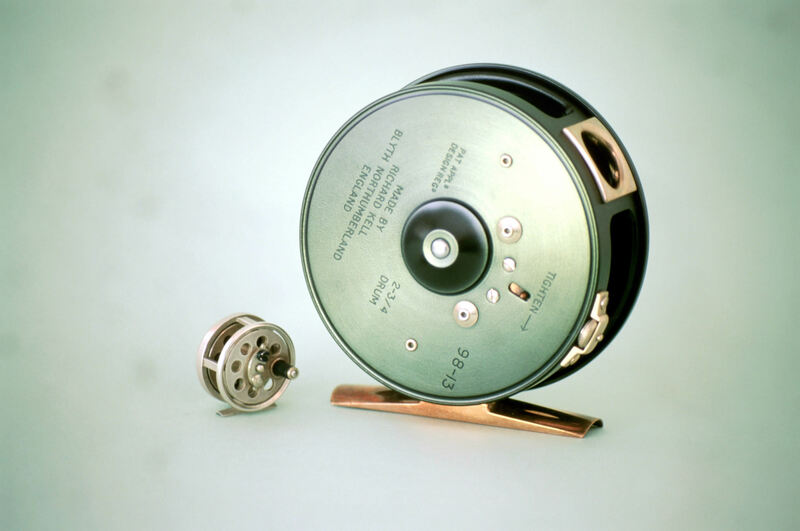 Internally the reel has a hardened and tempered to blue â€˜Câ€™ spring as in vintage reels. The real work in this item was designing and making the multi-part brass moulds to produce the waxes to send to the lost wax casting specialists. Iâ€™ve also the tooling to make matching silver rod joints and handle fittings including a tiny ebony pommel. I donâ€™t make these reels currently, it was too intense, I sickened myself. Considering the intensity and manhours involved to make these reels and my endless pursuit of 'better' at present I would work on a price of around the £2k mark minimum for any fly or Spey reel.